Earlier this month, Apple unveiled a new site to showcase HTML5. On it, Apple showed off a number of impressive web demos coded using only HTML5 technologies. However, at least on the main page, these demos were restricted to working on only Apple’s Safari web browser. 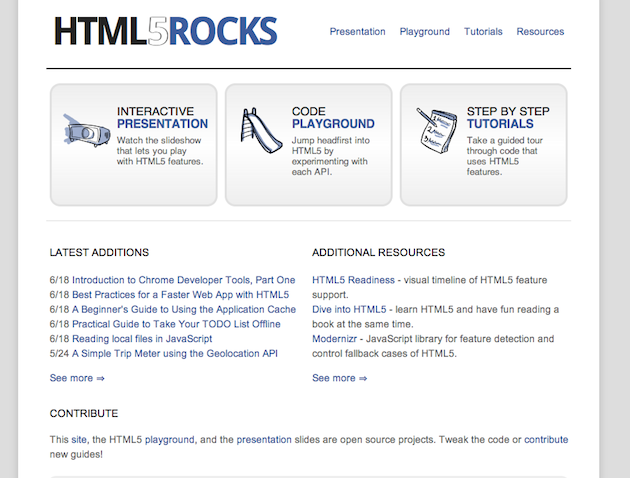 So now Google is countering with its own HTML5 site — called, get this, HTML5Rocks. Google and Apple are arguably the two biggest companies attempting to push HTML5 forward. Notably, both also dominate updates to the WebKit rendering engine (with both Safari and Google Chrome use). But both also seem a bit at odds with HTML5 because both have popular mobile platforms that use native applications not coded with HTML5. In recent weeks though, the two companies (which are in the middle of a war with one another) seem to be trying to show that each is fully committed to the open web. The presentation was originally meant to run in Google Chrome. Some experimental features might or might not be coded to run in other browsers for now. (Although you will cry out of happiness when you see so much running in IE with the Chrome Frame plug-in). If you want to run 100% of the demos contained in the presentation you might need to run Chrome with the webgl flag enabled. Take that, Apple (and Microsoft). Because HTML5 and its related technologies cover so much ground, it can be a real a challenge to get up to speed on them. That’s why today we’re sharing HTML5 Rocks, a great new resource for developers and teams looking to put HTML5 to use today, including more information on specific features and when to use them in your apps.